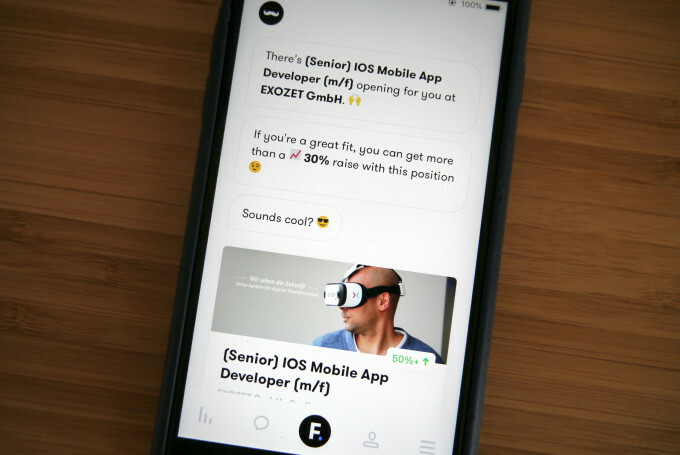 MeetFrank, aka a ‘secret’ recruitment app that uses machine learning plus a chatbot wrapper to take the strain out of passive job hunting and talent-to-vacancy matching, has closed a €1 million (~$1.1M) seed funding round to fuel market expansion in Europe. Hummingbird VC, Karma VC, and Change Ventures are the investors. The Estonian startup was only founded last September but says it has ~125,000 active users in its first markets: Estonia, Finland, Sweden, Latvia, Lithuania, plus its most recent market addition, Germany, an expansion this seed has financed. Around 2,000 companies are using the app to try to attract talent. In Germany employers on board with MeetFrank include Daimler, Eon, Delivery Hero, SumUp, Blinkist, High Mobility and MyTaxi. “The average company profile we have at the moment is a start-up/scale-up company that develops their product in-house,” says co-founder Kaarel Holm. He names TransferWise, Taxify, Testlio, Smartly and High-Mobility as other early customers. 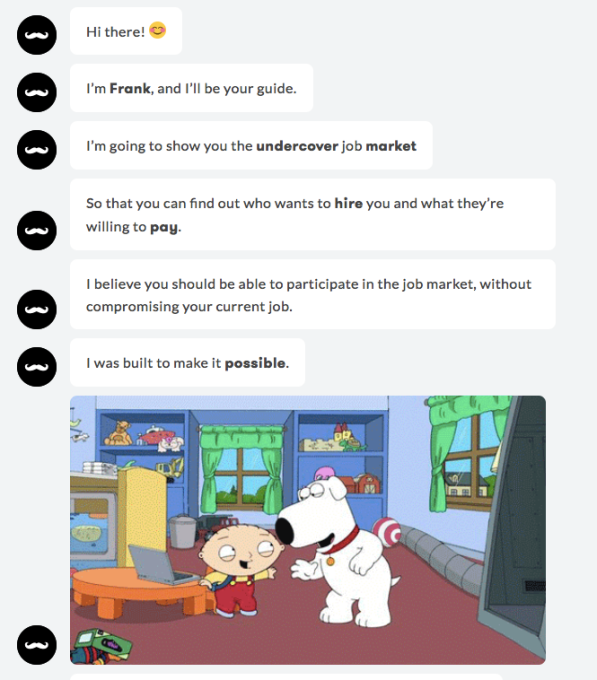 Here’s how MeetFrank works on the talent side: The person downloads the app and goes through a relatively quick onboarding chat with ‘Frank’ (the emoji-loving chatbot) where they are asked to specify their skills and experience — choosing from pre-set lists, rather than needing to type — plus to state their current job title and salary. So while MeetFrank’s target is passive job seekers, these people do still need to actively download the app and input some data. The bot also asks what would convince them to switch jobs — offering options to choose from such as a higher salary, more flexible or remote working working, relocation, a startup culture and so on. The anonymous aspect comes in because there’s no requirement for users to provide their real name or any other identifying personal information in order to get matches with potential positions. Talent is therefore assessed on its merits, at least at this stage of the job hunt. And while people are asked up front to specify their current salary, which you might think puts them at a potential disadvantage during any pay negotiations, Holm says the aim of MeetFrank’s platform is also to encourage greater openness from employers and steer away from traditional pay negotiation situations. “The policy of MeetFrank platform is that companies have to be extremely open about the position they are trying to fill — this also includes the salary information,” he adds. Employers are not at all anonymous on the platform. On the contrary, they have to write detailed job advertisements — including levels of pay for advertised roles. And a pay range will be disclosed to applicants that the app deems potentially suitable — i.e. after its matching process — by displaying a percentage of how much more they could earn above their current salary. So employers need to be comfortable showing their hand to people who may just be curious what’s out there. For employers, MeetFrank takes over the ad placement process — using its machine learning to algorithmically match potential candidates to positions. So its proposition is automatic pre-selection across “thousands” of potential job applicants. And also the possibility of reaching talent which might otherwise not realize that company is hiring. Or think about working for a certain brand. The app is mainly focused on a “passive talent pool” — aka “currently or recently employed talent that is open for offers”, as Holm puts it. So it’s certainly cherrypicking easier types of jobs to match and fill. “Entry level jobs is bit out of reach for us at the moment but we will launch a beta project with couple of universities in the autumn this year,” he adds when we ask if the app is open to matching people who don’t currently have a job or are looking for a first job. Holm says MeetFrank is currently showing 50% MRR growth. It’s already out of the pre-revenue phase — so is charging employers to advertise (the service remains free for the talent side). The main monetization model is a daily subscription, with employers being charged on a pay-as-you-go basis. Holm says the price per day for employers is €9, and MeetFrank lets them cancel at any time — with no minimum time commitment required to sign up. “We believe that the new-aged classifieds will only monetize on that kind of on-demand model and should only pay when they find us useful. This also lowers the barrier of entry to most of the start-ups and allows them to vet the market and get visibility with low budgets,” he adds.